But how did the neoliberal revolutionaries so easily conquer the bastions long held by Keynesians until then? The explanation can be found in the unresolved and misunderstood events of the 1970s. The following chart shows that two phenomena occurred during this decade, the combination of which bolstered neoclassical-monetarist arguments. First, the wage rate rose in all major industrialized countries, because after the oil price explosions the still-powerful trade unions were able to achieve double-digit wage growth rates in conditions of full employment. Somewhat later, as the figure shows, unemployment rose in the entire Western world. What could be more obvious than to dust off the neoclassical theory about the connection between high wages and sluggish demand for work—and to use this apparently undeniable evidence to give Keynesianism the final hit? Yet the relationship between wage levels and unemployment rates was by no means so straightforward. High oil prices and wage hikes also drove inflation to undreamed-of levels. Central bankers around the world reacted by raising interest rates. This was tantamount to adding a new demand shock to the original negative demand shock, which was caused by the oil price increase itself. This second shock triggered the collapse of investment activity all around the world, and was the immediate cause of skyrocketing unemployment. These events are typically ignored in the neoclassical narrative. But the Keynesians of that era had lost control over the interpretation of events, while the neoclassical arguments had simple and seemingly unbeatable evidence on their side. The failure of Keynesianism to deal with the new phenomenon of stagflation appeared obvious, and so the victory of its “supply-side” critics was assured. The following decades were by no means a global success story, but the mainstream narrative nonetheless christened this period as the “Great Moderation.” This story took shape under the pretense that the decades from the 1980s to the end of the century had been very successful, because there had been neither major economic crises nor major tensions between inflation and unemployment. While the latter is true, enormous global shocks such as the Mexican peso crisis, the Asian financial crisis, Latin American debt crises, and the Russian crisis have to be ignored to make sense of the former. Regardless, the death knell for the Great Moderation rang anyway in 2008, with the outbreak of what is now called the Great Recession. This financial shock did not become a new Great Depression only because most Western governments reacted quickly, bailing out speculators and stabilizing demand. In the aftermath of these events, a revival of Keynesianism might have been expected, or at least the neoclassical doctrine might finally have been thrown into the dustbin of history. But far from it. Though monetarism is gone, even the obvious failure of neoclassical orthodoxy to explain the dramatic rise in unemployment (and/or the decline in labor force participation rates), coupled with the persistence of low wages, has not awakened Keynesians from their hibernation. At the same time, the Keynesians have lost their political base. In almost all countries, social democratic parties—driven by an extreme and irrational debt phobia—have completely renounced Keynesianism. Paradoxically, the inevitable result of this debt phobia has been soaring debt levels around the world, and the corporate behavior inspired by the neoliberal revolution is increasingly undermining the market economy. The chart above indicates another important fact that is largely overlooked: the wage rate at the outbreak of the 2008 financial crisis was not high. In fact, it was very low—lower than it had been since before World War II. Despite the prevailing low wages, however, the crisis caused unemployment to rise to its highest level since World War II, shifting the balance of power in the labor market even further in favor of employers. The result was a deflationary trend in wages, as we have seen almost all over the world since 2008. Nevertheless, Keynesians have missed this opportunity to make up points. They have failed to show that rising unemployment in the aftermath of the financial crisis, accompanied by low wage increases and a very low wage-to-GDP ratio, disproves neoclassical ideas about the normal functioning of the labor market. Indeed neoclassical and other liberal economic theories, whether derived from monetarism or efficient financial markets, have for decades been unable to account for economic reality and can no longer offer relevant statements on economic policy. The core neoclassical narrative on the “labor market”—that it is a market like any other—has a long history. The original dispute over the functioning of the labor market revolved around the question of whether workers’ wages are primarily determined by existing power relations or whether wage levels obey economic laws (i.e., that they are determined anonymously in a functioning market with normally shaped supply and demand curves). Economists who firmly believe that economic law will prevail, typically on the basis of the theory of marginal productivity, have held the upper hand during most of modern economic history. Today, however, we know much more about the functioning of the labor market, especially concerning the overall economic feedback of wage levels on the demand for goods and employment. We know that supply and demand in the labor market are not independent of each other and, therefore, that assuming independent and normally shaped supply and demand functions is completely misleading. But this is systematically and consciously ignored. In the Western industrialized countries, there is a broad consensus that wealth distribution over the past two decades has changed to the detriment of workers. For lower-income earners in particular, wages have fallen sharply in relative and sometimes even in absolute terms. The most frequently used Gini coefficient shows growing inequality in almost all countries. While it is perfectly clear that the personal distribution has changed in favor of employers and the wealthy, the shift in the so-called functional distribution—the shift in favor of capital and at the expense of labor—should not be ignored. This was to be expected; it was after all the explicit aim of neoliberal policies (often justified by neoclassical economics) to change the economic power distribution in favor of businesses and the well-off. The effects are clear: the following figures show the development of real salaries and productivity per hour in Germany and France since the beginning of the European Monetary Union. 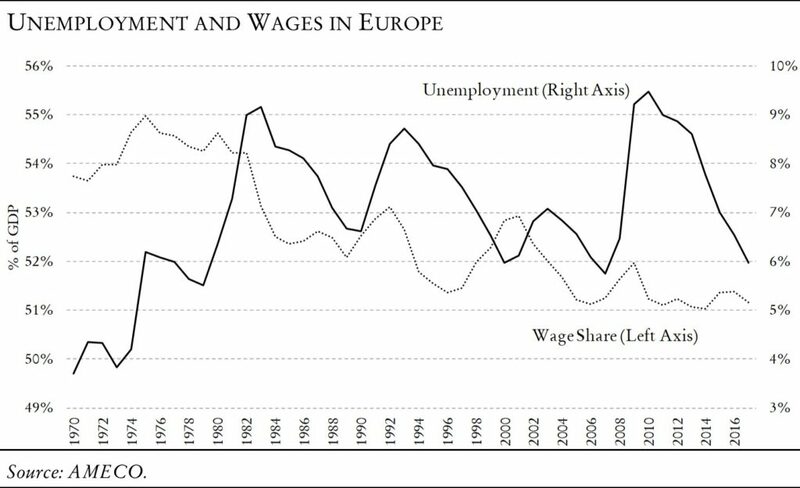 With approximately the same level of unemployment at the beginning of the century in both countries, political power in Germany was used to pressure the trade unions to allow real wages to lag behind productivity. Consequently, many wages in Germany remained below their marginal productivity, which, according to the neoclassical view, is impossible. The limit supposedly represented by marginal productivity was shown to be purely theoretical, and in practice proved to be no match for the powerful effects of state policies. This comparison demonstrates the superiority of the Keynesian view of labor markets, and illustrates the bankruptcy of the neoclassical view. The prerequisite for a functioning neoclassical market process, namely free and fully effective competition, is hardly ever present in labor markets. The real factors determining the balance of power, in particular the employment situation and the effective availability of social insurance for employees in the event of unemployment, cannot be ignored. In the case of underemployment and open unemployment—conditions which prevail in most of the world—there is no fully effective competition. In this situation, companies benefit from the existence of workers who are prepared to work for much lower pay than the fictitious marginal product value, especially if the alternative is unemployment and the danger of privation. The lower the level of social insurance, the less effective competition is among workers. Furthermore, the neoclassical position is untenable for a more fundamental reason. Even with full employment, the idea of a “marginal productivity” of labor somehow attached to each individual in the working process is a complete fiction. In an absolutely standardized production process, such as an assembly line, the employer may know exactly the growth in production and costs if an additional worker is employed. For the vast majority of activities in highly complex modern production networks, however, this is unknown and unknowable. Meanwhile, in the full-employment scenario, neoclassical theory holds that the employer has to pay the prevailing market wage. (In the case of unemployment, he may attempt to pay less as he is in a favorable negotiating position.) But what determines the usual market wage? Isn’t that labor productivity? In fact, average area-wide wages are closely related to area-wide productivity. 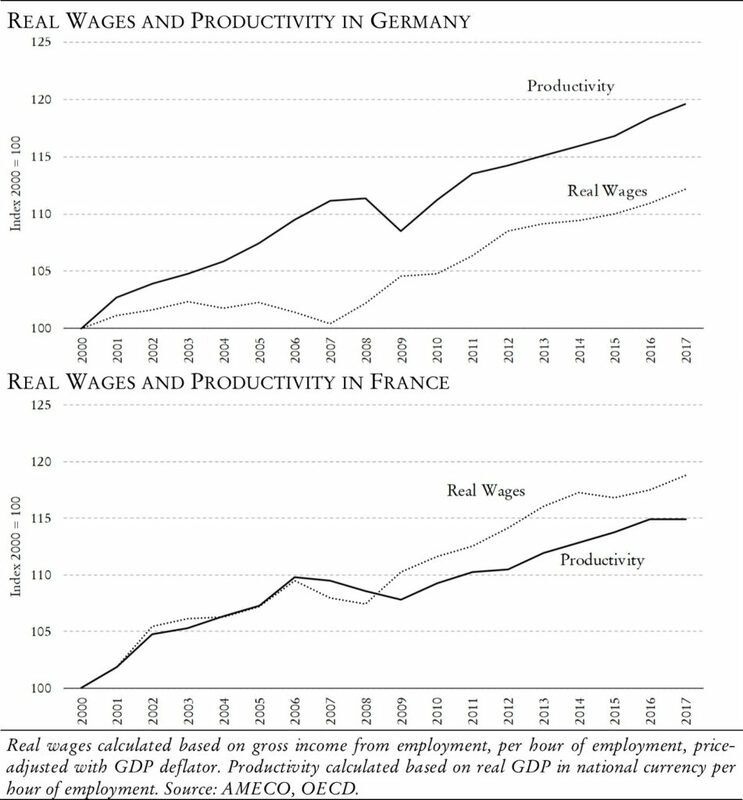 The dynamics of real wages over time (i.e., the annual changes) are closely linked to productivity in most developed countries. The important point here is that these regional productivity developments are totally unrelated to individual productivity. This is convincingly demonstrated by the annual adjustment of wages in the service sectors. Although services do not experience the same productivity changes as manufacturing jobs, they are adjusted according to the average productivity growth in the economy. Incidentally, if trade unions are weak, area-wide productivity would determine wages even in the case of “perfect competition” among companies. Even then, real wages in all areas would have to increase independently of individual productivity growth. This increase would occur because prices of goods produced in particularly productive sectors would be falling and thus real wages would be increasing, even for those, at work in other sectors, who have not become more productive at all. Under these conditions, the connection between individual productivity and wages disappears completely over a number of years. Occupational groups such as primary school teachers or nurses, whose individual productivity remains unchanged over decades, nevertheless experience real wage increases in line with overall area economic productivity. Other occupational groups disappear completely because they are no longer needed in the course of structural changes in demand and existing technology, but are neither willing nor able (at least in full employment) to prevent the disappearance of their activities by adjusting their wages downwards. Others, favored by structural change, can demand increasing wages because their skills are scarce, but not because their individual productivity, in terms of technical productivity, increases rapidly. The concept of individual marginal productivity is also untenable because productivity itself depends on wage dynamics. The demand for goods produced by all workers is not independent of wages. This means that the supply and demand curves in the so-called labor market are not independent of each other. Only if wages rise will the demand for work increase sufficiently. Therefore, employment is not simply a function of rising or falling real wages, which means that there is no labor market whose functioning would be comparable to a normal goods market. The wage dynamics in a closed system, such as the world economy, are therefore quite different from those predicted by the neoclassical theory. A reduction in nominal wages can either lead immediately to a price reduction—which makes the hoped for (from the neoclassical perspective) positive employment effect of the real wage reduction impossible—or to a real wage reduction, because the prices do not react immediately. In any event, however, the reduction in real wages certainly leads to a rapid reduction in demand, which undermines the positive employment effect predicted by neoclassical theory. In an economy such as Germany’s, where foreign demand, especially in manufacturing, is now larger and more important than domestic demand, labor faces a different situation in collective bargaining. On one hand, it is undeniable that individual companies or entire industries can gain an advantage in foreign trade, at least temporarily, through lower wage agreements. But it is also undeniable that companies threaten to migrate to low-wage countries if their demands are not met. If, as has been the case in Germany for fifteen years now, the trade unions bow to these foreign trade arguments, and the country evades an appreciation of its currency (because of a monetary union), real wages can be completely separated from productivity for several years. As long as the negative effects on domestic demand are offset by ever rising gains from exports, the country may enjoy its privileged position. That such imbalances will eventually destroy the monetary union that makes them possible is undeniable, but in the long run those responsible for the lasting damage to the whole region may be dead. True believers in functioning markets insist that profits are generated only by those companies that are able to successfully hold their market position by increasing their individual productivity. In this case, profits automatically have a purpose: namely, to direct the efforts of companies and investors to where they can expect the highest return. Strictly rejected by neoclassical theory is the existence of so-called rents—i.e., profits that are not directly related to successful efforts in a competitive environment. But reality is not as simple as neoclassical theory. When profits fall to a German car manufacturer because it benefits from a combination of state-initiated wage dumping and a unique monetary union, is that profit or rent? What about the profit that a company makes because the CEO of its most important competitor dies in an accident and the company cannot find a suitable successor? What about the incredible profits a company like Facebook makes because of network effects? Finally, what about the famous pioneer rents of the Schumpeterian entrepreneur (i.e., the monopoly rent that arises because he combines higher productivity from an innovation with existing wages)? Are they justified, and for how long? Does this concept also apply to companies that successfully relocate their production to low-wage countries, thus combining their high productivity technology with low, developing-country wages? There are many questions about the theoretical distinction beween profits and rents, but few answers. Since in reality there is never perfect competition, the distinction between profit and rent is useless for all practical purposes. Overall return is always composed of both rents and profits, and it is impossible to separate one from the other. 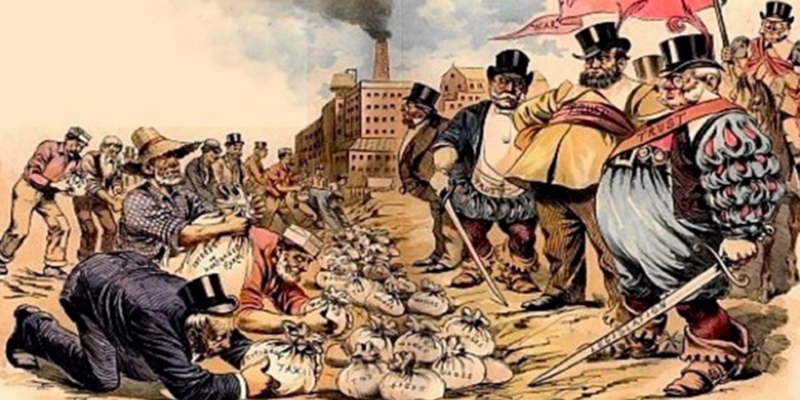 These issues all point to a broader question: how have global corporations used the extraordinary power that they have acquired in the course of the neoliberal revolution? After all, companies freed from government constraints and high taxes were expected to create a new dynamic, entrepreneurial environment driven by the flourishing of private investment activity. In this respect especially, however, the promises of the neoliberal turnaround have failed to materialize. The truth is exactly the opposite. The neoliberal revolution has not only failed to live up to expectations, but it has brought about a change in corporate behavior that fundamentally threatens the functioning of the market economy. Yet neither liberals nor conservatives nor social democrats in the Western industrialized countries are willing to take note of this change, much less draw the necessary political conclusions. Old policy debates are no longer even relevant. For example, neoclassical and Keynesian economists usually agree that the state must act countercyclically: running deficits during a recession while generating surpluses to reduce debt in periods of robust growth. Permanently rising debt levels, according to both narratives, entail unsustainable and unjustified burdens in the long term. Although these principles are generally accepted, for many decades people have argued over whether governments would actually run surpluses during the good times. The Keynesians were confident about the capability of the state to act prudently, but the neoliberals were highly suspicious and did not trust the state to sensibly adjust budgets. Germany, however, has been proving for years that the Keynesians were right and that it is possible for the state to behave symmetrically. Unfortunately, as is often the case with simple stories, they do not quite account for reality’s cruel complexity. The world has changed so fundamentally that both sides must rethink their positions. The textbook economy that both neoliberal and traditional Keynesian doctrines presuppose has been a thing of the past for quite a while. Now surviving only in theory, this was a world in which companies still fulfilled the most important task assigned to them in a market economy—namely, to serve as the most important debtor and the most important investor at the same time. 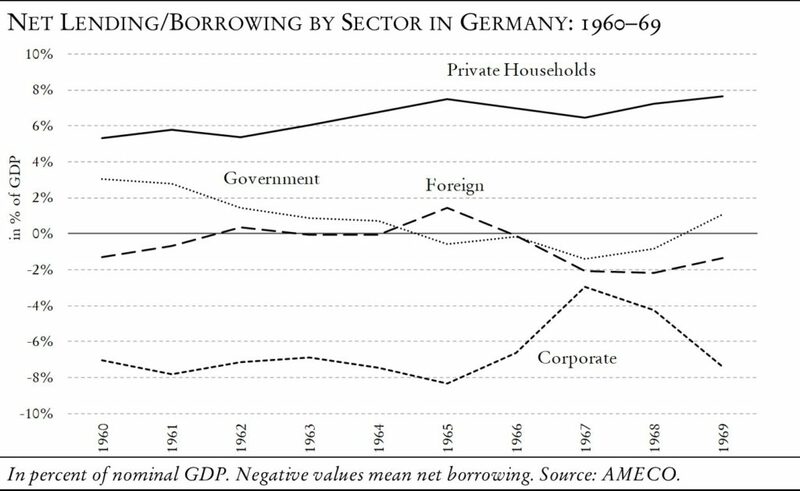 For example, in the 1960s, the debt of enterprises was the natural counterpart to the net saving of private households in Germany. During this period, the state was easily able to achieve a balanced budget because the business sector assumed the role of both debtor and investor. Looking at the same financial balances today, however, reveals a totally different world. Now the (nonfinancial) companies are net savers (i.e., show surpluses in their financing accounts). Furthermore, since the state is also eager to reduce overall indebtedness, German savings can only be balanced by the liabilities of foreign (deficit-running) countries. 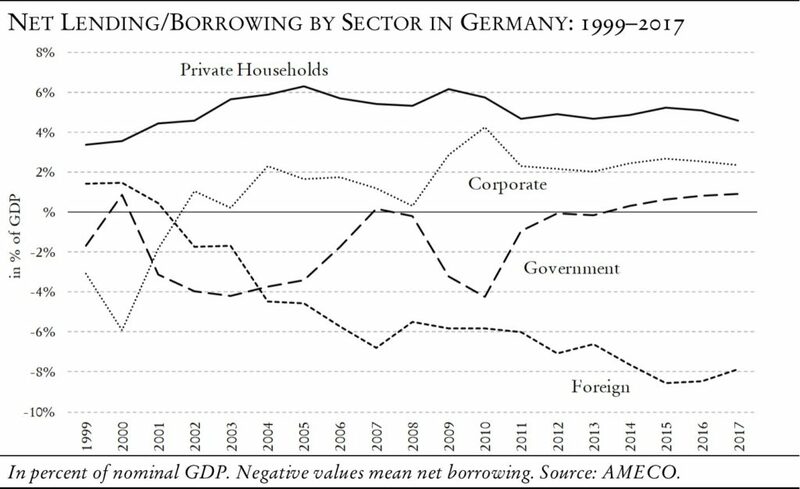 German mercantilism is about to achieve what neoliberals have been dreaming of for many decades—sustained government surpluses. Unfortunately, the price for the rest of the world is high and ultimately unsustainable. A situation in which the corporate sector is a net saver and foreign countries are the only debtors is impossible to achieve at a global scale and self-undermining in an economy closely intertwined with its trading partners. The whole idea of a market economy—across all schools of thought—is based on the principle that the corporate sector should be largely responsible for the profitable use of savings. But not only is the theoretically predicted transformation of savings into investment a fiction, the corporate sector no longer systematically closes the demand gap created by the net savings of private households through business investment. Companies acting as net savers are by no means unique to Germany. In the United States (a large, relatively closed economy, in which external relations are of comparatively little importance), the financial balances between economic sectors (i.e., net saving on the one hand and net debt on the other) show the same pattern, but portend even greater problems. These changes in basic economic activity became glaringly apparent after the global financial crisis of 2008, but the deeper trends were present even earlier. 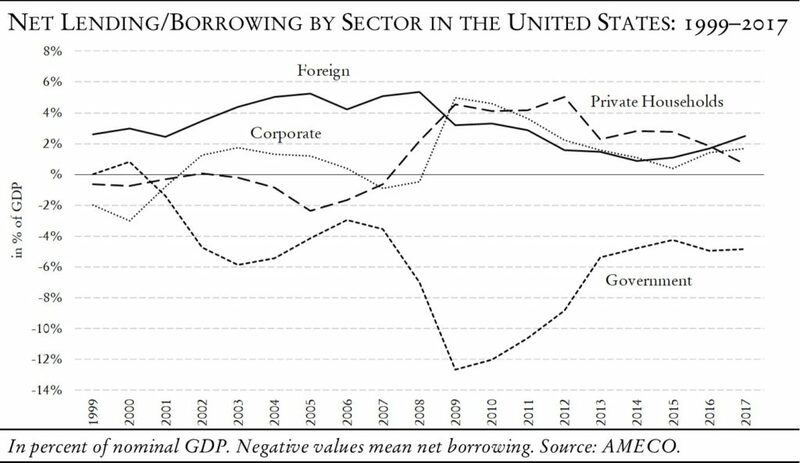 In the United States, the corporate sector—which was a net debtor until the turn of the millennium—has been a net saver, along with private households, since 2008. Moreover, because the United States suffers from a current account deficit (i.e., is still struggling with a demand gap in foreign trade), there is no other place for the government to be than on the debtor side. Without the government as the only debtor, the economy would collapse. Wherever foreign trade does not play a major role—including in large economic areas such as the United States and Europe (and there is no foreign trade for the world as a whole! )—if companies systematically change from debtors to savers, then the fate of public finances is sealed. The government will have to incur new debts forever—no matter how large the absolute debt level is. Medium-sized mercantilists like Germany may evade this fate for some time through even higher current account surpluses, but this “solution” is irresponsible—adding to destabilizing imbalances—and should be penalized by the international community. The whole discussion about debt must start right here. Pleading for higher public investment is useful, but the old notions on prudent public finance are fundamentally obsolete. The current controversies in Europe show that the fate of the continent depends on this question. “Pro-market conservatives” are almost always completely mistaken on this matter, but the majority of citizens share their microeconomic view and ignore macroeconomic logic. The old social democratic parties are also shadows of their former selves, and refuse to seriously address these economic issues. But if there is no new political movement that dares to take up this issue effectively, then the debt problem will remain unsolved and continue to play into the hands of irresponsible politicians. In the new world of companies as net savers, it is no longer necessary to philosophize about whether or how quickly the state should use “the good times” to limit its debt. The good times simply do not exist, because the companies have become so powerful that they can no longer be pushed into the role of debtor and investor. This counterproductive corporate behavior, moreover, is the direct result of the neoliberal revolution, which means that the neoliberal “supply-side policy” is directly responsible for today’s massive and inevitably rising public debt. Congratulations! Richard Koo, one of the few economists who continues to raise this question and who has consistently reminded the state of its role as debtor, believes that the changed behavior of companies has to do with balance sheet recessions. His thesis is that, after a recession, companies are trying to break even in order to put their balance sheets in order. This was perhaps an appropriate explanation immediately after the global crisis, but it is no longer the case today. There can be no doubt at present that the long-term shift of economic and political power in favor of the corporate sector, which has been directly promoted by many conservative governments since the 1970s and is still promoted today, is responsible for the secular shift in the behavior of corporations. If the latter is true, the market economy or “capitalist system” is on a direct road to collapse worldwide. The power of companies, namely their freedom to choose whether they want to be savers or debtors, directly implies a dramatically increased role for the government in terms of investment and job creation. The old call on governments to reduce debt and to back down in favor of companies is now more than obsolete; it is outright stupid. The whole private sector as net saver forces the government permanently into the role of serving as the engine for the market economy. Political systems that persist in maintaining such imbalances—and the delusional ideologies that justify them—tend to collapse in a short period of time. 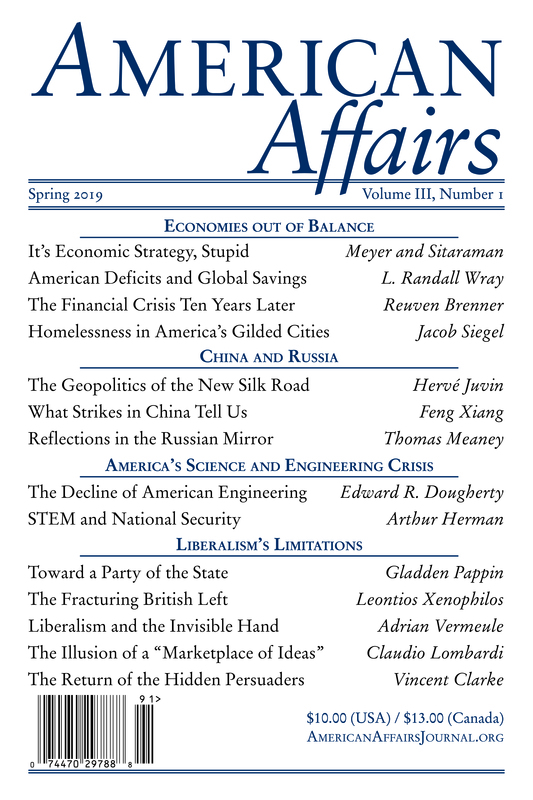 This article originally appeared in American Affairs Volume II, Number 4 (Winter 2018): 66–78. Paul Steinhardt is a former executive in structured finance at Deutsche Bank and its subsidiaries. He is the coeditor of Makroskop.